Chile is one of the 35 countries in the world where opening a business takes the least time. According to the World Bank’s Doing Business 2018 ranking, setting up a company in Chile is quicker than in, for example, the United States. In Chile, there are two ways to start a company. The first, in the framework of the “Tu Empresa en un Día” (Your Company in One Day) initiative, is designed for use by small companies and the process can be carried out online. The choice of this or other options, given that there are various possible company structures, will depend on factors such as the investor’s business strategy and the scale of the equity contribution. The company structures most commonly used by foreign investors in Chile are: Individual Limited Liability Company (EIRL); Limited Liability Company; Corporation (S.A.), which can be public or closed; and Stock Company (SpA). Companies must, in general, be established by public deed before a public notary. The deed specifies matters such as the type of company, its field of activity, its partners and their respective equity contributions, how profits will be distributed and how the partners will answer for any losses. The National Tax Service (SII) is the public body responsible for overseeing compliance with tax obligations. Key parts of the process of starting operations in Chile involve the SII. They include the registration of a domicile or residence for tax purposes; obtaining a Chilean tax number (RUT), which is required before materializing an investment, and appointing a legal representative; presenting the sworn Start of Activities Statement in which the taxpayer informs the SII of the intention to undertake activities in the country that may be liable to tax; and stamping the documents that will be used to record the company’s activities in the country. The company must then obtain the specific permits required for its activity (building, health, environmental permits, etc.). Finally, it is necessary to obtain a municipal license which must be paid once all the other permits have been obtained. 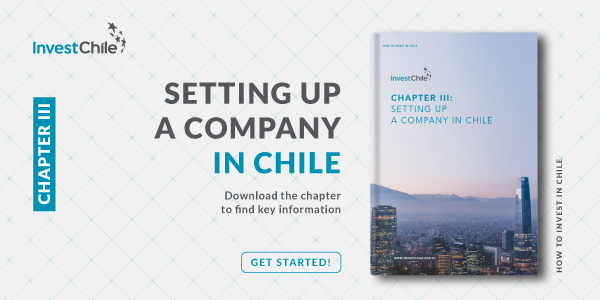 For further information about these and other aspects of starting operations in Chile, download this chapter of our Investor's Guide.